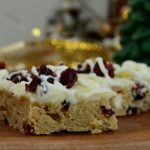 I found this recipe years ago and have been making these cranberry bliss bars every year since. The recipe comes from MrBreakfast. Beat butter and sugar together for the cake base, and add eggs/vanilla beating until fluffy. Sift together flour, ginger, and salt and then add to the butter/sugar mixture beating well. Fold in the cranberries, chocolate and ginger. Spread thick batter in pan and bake for about 20 to 25 minutes or until light golden. The cookie base should be fairly thin–about 1/2 inch to 3/4 inch thick. Mix butter, powdered sugar and vanilla together to make a slightly thick frosting. You may need to add the heavy cream to ensure it can spread easily. Once the cookie base is cooled, spread a thin layer of frosting over it. Sprinkle with the minced cranberries. Melt white chocolate chips and coconut oil in the microwave, using 10 second pulses, to ensure they don’t burn. I used a Ziploc bag to drizzle the chocolate on the cookie with diagonal lines. Cut into bars (either rectangles or triangles) and chill for at least 30 minutes before serving.